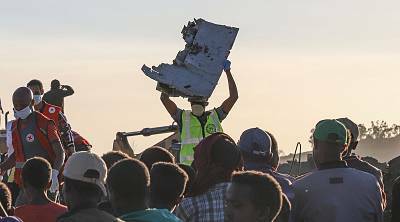 ADDIS ABABA, Ethiopia — The crew of the Ethiopian Airlines jet that crashed last month followed proper procedures when their Boeing Max 8 repeatedly nosedived but were unable to control the plane, according to the first official report on the disaster.The preliminary report recommends that the flight control system should be reviewed by Boeing. "The crew performed all the procedures repeatedly provided by the manufacturer but was not able to control the aircraft," Ethiopian Transport Minister Dagmawit Moges told a news conference Thursday. Moges said "repetitive uncommanded aircraft nose down conditions" had been identified.She recommended that Boeing review the aircraft control system and aviation authorities confirm the problem had been solved before allowing that model of plane back into the air.The Boeing 737 Max 8 jet crashed on March 10 shortly after takeoff from Addis Ababa, killing all 157 on board. It was the second crash of a 737 Max within five months, following a Lion Air crash in Indonesia.Following the Ethiopian disaster, the Max jets have been grounded worldwide pending a software fix that Boeing is rolling out, which must still receive approval from the Federal Aviation Administration and other regulators. The preliminary report into the Lion Air disaster said the pilots lost control after grappling with the plane's Manoeuvring Characteristics Augmentation System (MCAS) software, a new automated anti-stall feature that repeatedly lowered the nose of the aircraft based on faulty data from a sensor.Boeing declined to comment pending its review of the preliminary report.